For a few hours on the night of Dec. 20 to Dec. 21, theattention of tens of millions of people will be drawn skyward, where the mottled,coppery globe of our moon will hang completely immersed in the long, taperingcone of shadow cast out into space by our Earth. If the weather is clear,favorably placed skywatchers will have a view of one of nature's most beautifulspectacles: a total eclipse of the moon. Unlike a total eclipse of the sun, which is only visible tothose in the path of totality, eclipsesof the moon can usually be observed from one's own backyard. The passage ofthe moon through the Earth's shadow is equally visible from all places within thehemisphere where the moon is above the horizon. 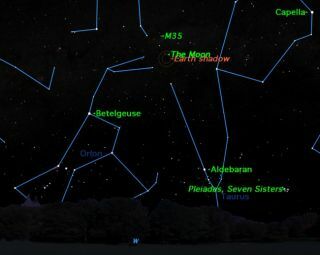 This starchart shows where in the sky the upcoming lunar eclipse will appear.And check this NASAlunar eclipse chart to see how visible the eclipse will be fromdifferent regions around the world. There is nothing complicated about viewing this celestialspectacle. Unlike an eclipse of the sun, which necessitates specialviewing precautions in order to avoid eye damage, an eclipse of the moon isperfectly safe to watch. All you'll need to watch are your eyes, but binocularsor a telescope will give a much nicer view. The eclipse will actually begin when the moon enters thefaint outer portion, or penumbra, of the Earth's shadow a little over an hourbefore it begins moving into the umbra. The penumbra, however, is all butinvisible to the eye until the moon becomes deeply immersed in it. Sharp-eyedviewers may get their first glimpse of the penumbra as a faint smudge on theleft part of the moon's disk at or around 6:15 UT (on Dec. 21) whichcorresponds to 1:15 a.m. Eastern Time or 10:15 p.m. Pacific Time (on Dec. 20). The most noticeable part of this eclipse will come when themoon begins to enter the Earth's dark inner shadow (called the umbra). Asmall scallop of darkness will begin to appear on the moon's left edge at 6:33UT (on Dec. 21) corresponding to 1:33 a.m. EST or 10:33 p.m. PST (on Dec.20). The moon is expected to take 3 hours and 28 minutes to passcompletely through the umbra. The total phase of the eclipse will last 72 minutesbeginning at 7:41 UT (on Dec. 21), corresponding to 2:41 a.m. EST or 11:41 p.m.PST (on Dec. 20). At the moment of mid-totality (8:17 UT/3:17 a.m. EST/12:17a.m. PST), the moon will stand directly overhead from a point in the NorthPacific Ocean about 800 miles (1,300 km) west of La Paz, Mexico. The moon will pass entirely out of the Earth's umbra at10:01 UT/5:01 a.m. EST/2:01 a.m. PST and the last evidence of the penumbrashould vanish about 15 or 20 minutes later. During totality, although the moon will be entirely immersedin the Earth'sshadow, it likely will not disappear from sight. Rather, it shouldappear to turn a coppery red color, a change caused by the Earth's atmospherebending or refracting sunlight into the shadow. Since the Earth's shadow is cone-shaped and extends out intospace for about 844,000 miles (1,358,000 km), sunlight will be strained througha sort of "double sunset," all around the rim of the Earth, into itsshadow and then onto the moon. However, because of the recent eruptions of theEyjafjallaj?kull volcano last spring and the Merapi volcano in Indonesia inOctober, one and possibly even two clouds of ash and dust might be floatinghigh above the Earth. As a result, the moon may appear darker than usualduring this eclipse; during totality, parts of the moon might even become blackand invisible. L = 0: Very dark eclipse, moon almost invisible,especially in mid-totality. L = 1: Dark eclipse, gray or brownish coloration,details distinguishable only with difficulty. L = 2: Deep red or rust-colored eclipse, with avery dark central part in the shadow, and outer edge of the umbra relativelybright. L = 3: Brick red eclipse, usually with a brightor yellow rim to the shadow. L = 4: Very bright copper-red or orange eclipse, with abluish very bright shadow rim. Examine the moon at mid-totality and also near the beginningand end of totality to get an impression of both the inner and outerumbra. In noting an L observation, state the time and optical means(naked eye, binoculars or telescope) that is used. We invite readers toe-mail their Danjon estimate for this eclipse (along with any pictures they'dlike to share) to cmoskowitz-at-SPACE.com. At mid-totality, from rural locations far from city lights,the darkness of the sky is impressive. Faint stars and the Milky Way willappear, and the surrounding landscape will take on a somber hue. Astotality ends, the eastern edge of the moon begins to emerge from the umbra,and the sequence of events repeats in reverse order until the spectacle isover. Interestingly, from most of New Zealand, a slice ofnortheast Australia, Papua, New Guinea, southwest Japan and Korea, the moonwill rise during totality on the evening of Dec. 21. Because of low altitudeand bright evening twilight, observers in these locations may not see much ofthe moon at all until it begins to emerge from out of the Earth's shadow. Conversely, much of the United Kingdom and parts of westernand northern Europe will see the moon set during totality on the morning ofDec. 21. Because of low altitude and bright morning twilight, observers inthese locations may not see much of the moon at all after it slips completelyinto the Earth's shadow. The last total lunar eclipse occurred on Feb. 20 to Feb. 21,2008 and was visible from most of the Americas, as well as Europe, much ofAfrica and western Asia. In 2011, there will be two total lunar eclipses. The first, on June 15, will be visible primarily from the Eastern Hemisphereand will have an unusually long duration of totality lasting one hour and 40minutes. Another total lunar eclipse will occur on Dec. 10 and willbe visible over the western half of North America before moonset. For thenext total lunar eclipse that will be visible across all of North America, we mustwait until April 14 to April 15, 2014.